So I went to the Boston ComicCon on April 21. First impression: So many people! It was supposed to open at 10 a.m. I got a slow start on the morning and got there just before 10, to find the line snaking all the way around the building. I waited for about an hour before the line started moving and I got in. Apparently, hours later, there will still people in that line. Around 2-3 p.m., I heard people saying, “I’ve been in line all day,” and “I only now just got in.” Crazy! Yes, there were quite a few “fight the crowd” moments when trying to get close up to booths and rifle through the half-off trades (Drool… half-off trades…), but it wasn’t as bad as it could have been. At last November’s SuperMegaFest in Framingham, Mass., there were so many people that you couldn’t walk around, you were just stuck in place with strangers’ bodies pressing against you (and not in a fun way). So the wide morass of people at ComicCon was an annoyance, but not so much to ruin the experience. It’s a weird balancing act with these conventions – too few people and it’s dreary. Too many people and it’s a pain. You need just the right amount of people for it to feel lively and fun. Con organizers have no control over this stuff, so whatever. After seeing countless online photos of cosplayers at the San Diego and New York cons, it warms the darkest chambers of my heart to see the cosplayers in full force in Boston. The standout cosplayer was the guy dressed as Mr. T. Not just looking the part, but in character the whole time. This was fun for the first few minutes, but after thatI wanted to ask him to take his “pity the fool” and “jibber-jabber” act to other side of the room. The crowds loved him, though. I was excited to see some more obscure characters represented in cosplay. Dressing up as Batman is one thing, but walking around in public dressed as Mirror Master? That’s a whole other kind of personality type. And let’s not forget the slutty female cosplayers. I saw slutty Emma Frost (redundant? ), slutty Batgirl (Stephanie Brown!) and two slutty Elektras (original, not movie version). Why don’t I have pictures? I could have, but I didn’t. Too much hassle, even to fumble with the phone, I guess. Although I did buy my share of half-off trades (ooohh, half-off trades…), I spent most of the my time – and cash – at artist’s alley, which, amazingly, covered a good half of the con space. With own ebook about to come out (Cine High! Cine High! Cine High! ), I was naturally interested in what the self-pubbers have come up with. 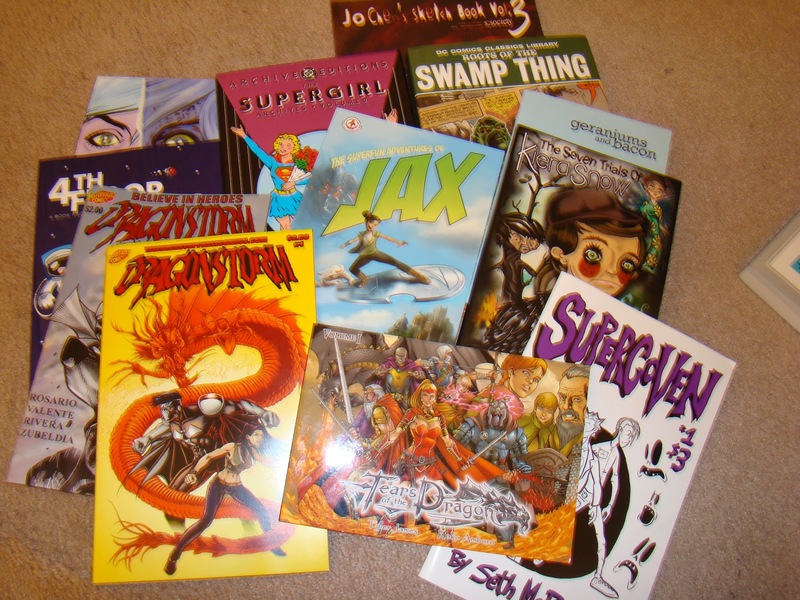 I picked up comics in various genres, such as superhero, fantasy, comedy, and even memoir. Great stuff all around. Artists like Time Sale, Becky Cloonan, and Ed McGuiness were there. McGuiness’s line stretched across the con floor. But I didn’t get in line for their autographs. Somehow, it was enough for me to walk by and see them there, knowing I’m in the same room as them. I was wicked excited to meet Jo Chen, cover artist for Runaways, Buffy the Vampire Slayer, and many other comics. She signed a print of the Runaways #1 cover for me, and said she loved working on Runaways because they gave her a lot of creative freedom to do the covers however she wanted. I was also wicked excited to meet Megan Brennan, co-creator of the webcomic School of World, as her Twitter feed is always fun and exciting. She and her co-conspirator Rel were very nice and creeped out by me at all, graciously signing a School of World book for me. Amid all the hustle and bustle, the biggest talk around the con was Womanthology, the Kickstarter sensation that has led to magnificent hardcover collection of work by a variety of female comic creators. Sadly, every copy sold out almost instantly, so I didn’t get one, but the message was loud and clear – comics are no longer a boys’ only club. The ladies have taken the comics world and made it their own. Womanthology was the center of attention throughout the entire con. To me, Womanthology means a little more than gender roles and comics. Womanthology started life with a single Tweet – 140 characters or less – and the whole things snowballed from there, so that the entire comics industry, if not the internet at large, stood up and took notice. The Womanthology creators are doing their own things, and the audience generates itself. I’m excited about that. It seems to me that this type of success is open to any writer or artist, of course. As Cine High is about be unleashed unto an unexpecting world, I’m well aware that sales may never rise higher than 20, or it might go viral and make billions upon billions of dollars. I just don’t know. If Womanthology started with a single Tweet, then it seems to me that any self-pubbed project has the same chance. And… that was the ComicCon experience for me.